Nothing says Florida winter like a warm, bright December afternoon; and nothing says Jacksonville quite like the Jaguars. While not always number one on the board, the Jags are always number one in our hearts. Plus, our Members know first hand how relevant a support system can be. 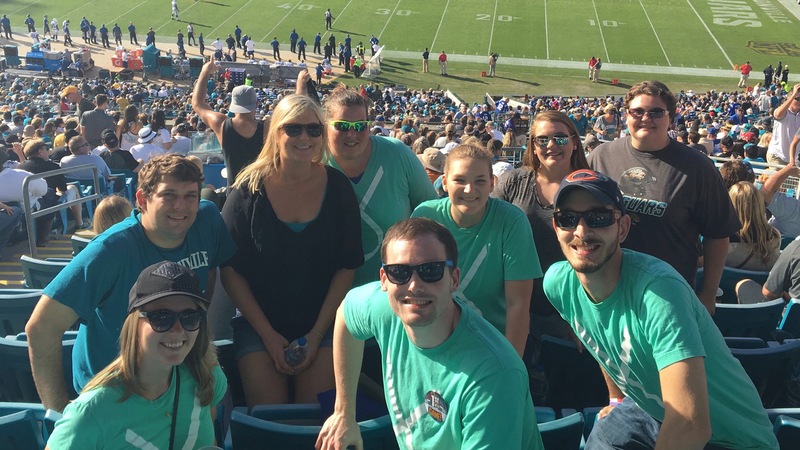 We could think of no better way to spend our Sunday afternoon than cheering for our local team as they took on the Colts. Live For Today made sure to do the game the right way. Before heading into Everbank Field, Members met up for a tailgate. Everyone was able to catch up and reacquaint themselves over Bono’s BBQ and, of course, the quintessential tail gating activity–corn hole! Once the energy levels were pumped up and the food had settled down, the crew made their way into the stadium. What a game it turned out to be! The Jags really put on a show, smashing the Colts with a 31-point lead. The crowd was going crazy and the Live For Today Members had a premium view for the entire experience. 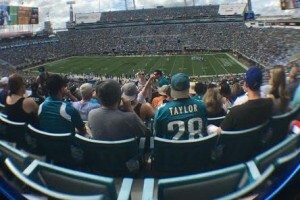 We sincerely send our thanks to The Jaguars for upgrading us to club seats! This even gave our patients and survivors the option to head inside and cool down when necessary. This was an extra special day for our new friend from England, Tanya. It was her first American football game. 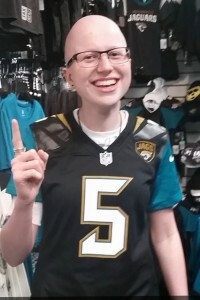 Loving everything about the day, Tanya declared herself an official Jaguar fan and wasn’t leaving until she had a jersey of her own. Another Member, Pavel, from Russia, commented on how much he had enjoyed learning about American sports with us. The Jaguars made this a difficult event to top and for that we can’t thank them enough!